Looking for stylish summer outfits? Wanna feminine but comfy pieces of clothes at the same time? Then you should pay your attention to wonderful lace shirts, for sure. We have gathered several looks with this type of shirts, tops and blouses just for you and we are ready to share them. First of all, you need to decide what type of shirt you’ll choose from a fitted to loose, long sleeved to sleeveless one, etc. After that, think about color of your new item and, of course, you should know that white and beige are the most popular and common colors for such blouses. Now look below and find your inspiration. If you’re a big fan of minimalistic or white and black combinations, then you can pair a white sleeveless lace shirt with black skinny pants, brown heeled sandals and a black chain strap bag. Or for creating a more elegant and chic look you can choose a white lace shirt and mix it with black straight trousers, flat sandals and a black and white printed clutch. 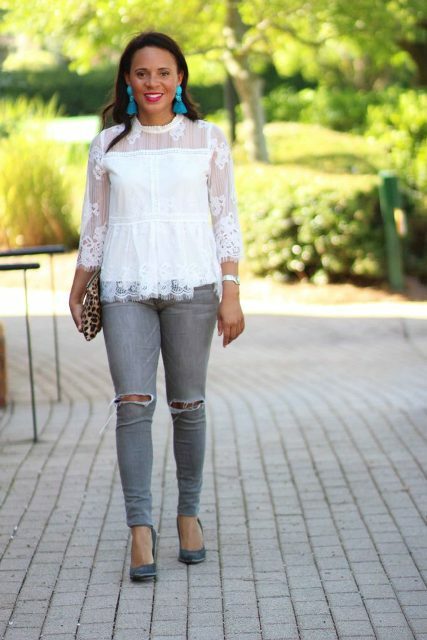 Don’t pick up only white blouses, you can take a pale pink peplum top and combine it with distressed skinny jeans, beige leather high heels and a beige leather bag. 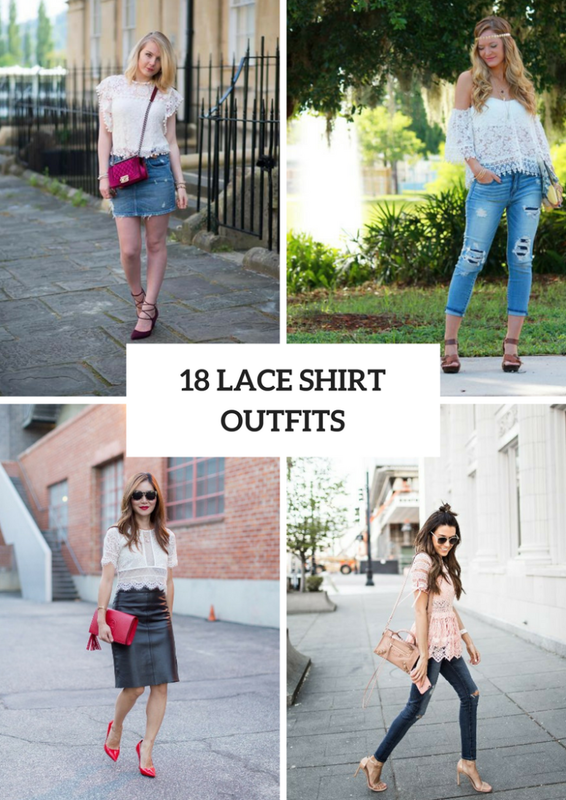 For those who wanna make an outfit with shorts, I offer to repeat a look with denim mini shorts, white ruffled lace blouse, a black crossbody bag and black leather lace up boots. For making a chic look you can take a beige long sleeved shirt and combine it with a red midi A-line skirt, beige pumps and a black mini clutch. Or mix a white crop blouse with a black leather knee-length skirt, red patent leather pumps, sunglasses and a red leather clutch.